Mix all of the ingredients together and place in refrigerator to cool and marinate for 2 hours. Serve with corn tortilla chips! I just found your site. I have been trying this approach for a while now, but every now and then I start eating something new that I was not aware of it being a Fodmap and it can get frustrating. Like spaghetti squash this last week. So very glad that you are kind enough to share current and updated info and scrumptious recipes like this one. I am very happy that I am not alone. Would you know why “The Specific Carbohydrate” diet would work so well for some people, but not others. I have a friend who has done that diet for 3 yrs and has not had a Crohns flare since. I have not been diagnosed, but I.B.S anyway, and the Fodmap diet is the only thing that has helped my flares. I get really bloated and my intestines all the way into my colon will burn and swollen shut,sometimes for days. Broccoli and onion, inulin and garlic are my worst offenders. Once again thanks for all that you give. The Specific carbohydrate diet allow foods that are high in fructose and for individuals with fructose malabsorption it may not work. Have you been tested for celiac disease and small intestinal bacterial overgrowth….these are important tests that should be used to rule out other conditions that may be contributing to your ongoing symptoms. thanks for your reply. No I have not been tested. Gluten does flare me even if it is refined, organic and sourdough. But gluten free grains I have no prob with. I am not willing to eat gluten for however long one needs to, to be tested. I live in Canada and doctors are very reluctant to test anything that is not old school. I am not sure which test I would ask for SIBO. Just really frustrating, especially when you are on a budget. I was wondering what you thought of this type of therapy. Thanks. Peppermint oil has been shown to provide some therapeutic benefit in individuals with IBS, particularly in pain management. There have been some studies suggesting that peppermint oil has an anti-microbial benefit so certainly it may be beneficial. Not sure we have definitive data to back its use for SIBO but it certainly is an interesting concept. thanks. I appreciatte your time. Thank you , I am just learning how to make my son’s life so much bettter on the low fodmap diet, he has a severe fructose malabsorption and he has been sick for over a year, we are happy to know what is going on with his body ,but he is 11 yrs old and he ate an all american diet so this is hard for him, no fruit juice kills him and he misses apples and pears , I am getting better and I want to make him a birthday cake for his birthday, I saw the low fodmap shopping list and the namaste brownie mix so you gave me an idea. thank you, he will have to be on this for life that is what the dr told us. Kathleen–be sure they check you son for small intestinal bacterial overgrowth which often coincides with fructose malabsorption. King arthur has some great gluten free and low FODMAP cake mixes too! Thank you, Matthew does not have SIBO ~ He was thought to have it but it is the Fructose that is the huge problem, 2 Drs think he have Esophillic Esophagitus as well as fructose,love to read the comments and others stories,My son suffers and the diet is severe. 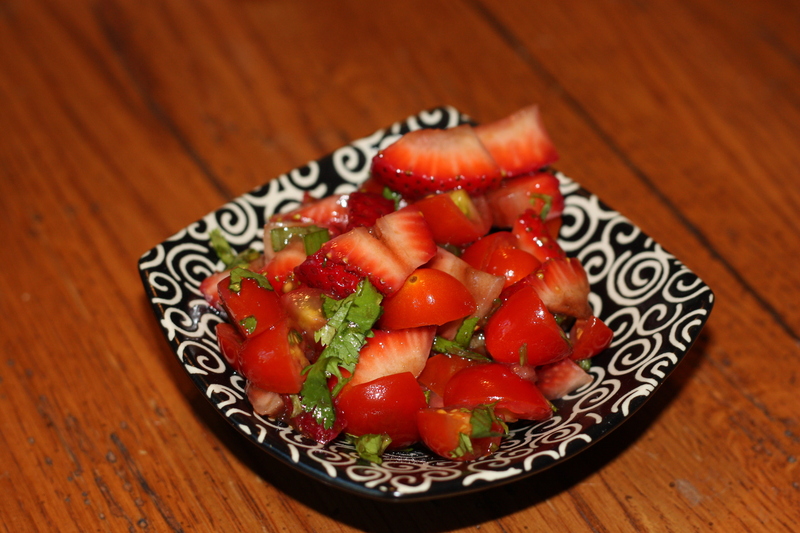 Your Strawberry Salsa recipe looks great, but did you know that Balsamic VInegar may not be totally gluten free? Some Balsamic vinegars are made in barrels that are sealed with wheat gluten paste. Just to be on the safe side, I’ll try this recipe using red wine vinegar. The low FODMAP diet is not a gluten free diet so this method of balsamic vinegar prep should not pose a problem. (Unless you have celiac disease and are adding the low FODMAP diet to the gluten free diet.) There is overlap with the gluten free diet as wheat, barley and rye are sources of gluten AND FODMAPs- but the low FODMAP diet CAN include traces of wheat and gluten. FODMAPs are carbohydrates and gluten is a protein- we are modifying carbs in the low fODMAP diet.